Trip to Cambodia visiting Angkor temples and other attractions. Photos of Cambodia. WHAT TO DO AND WHAT TO SEE IN CAMBODIA? This travelogue illustrates a Cambodia trip lasting five days, discovering the temples of Angkor and the capital Phnom Penh. Flying from Vietnam, I reach Siem Reap, the town which is the ideal base from which exploring the local famous temples of Angkor, both those who are near as well as those more distant. The tour of the temples of Angkor can be made by various means: renting a car with driver and tour guide is probably the most convenient one; the package which is typically offered along with the nights by many travel agencies that deal with this destination. After the tour of Angkor, including the great city of Angkor Thom, the temple of Angkor Wat, the "Small Circuit" with the Tomb Raider and the more distant temples of Banteay, the journey continues in Cambodia with a long car transfer to the capital Phnom Penh. 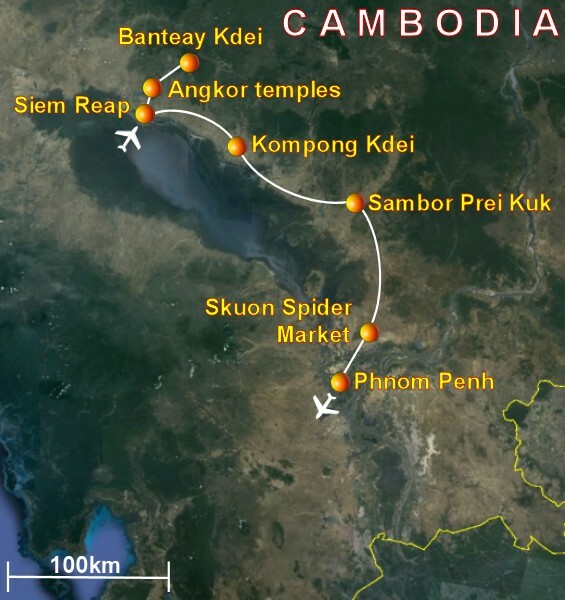 The road, which runs through the green heart of Cambodia allows to explore other archaeological ruins, as well as the market of spiders where fried spiders and other insects cooked with spices are sold. After a short tour in Phnom Penh, Cambodia tour ends at the international airport of this city to continue to the next destination. A tour to Cambodia is thus an excellent choice for who is interested in history and archaeology, but without forgetting also the ethnic aspect, thanks to the unique local traditions and customs. HOW TO ORGANIZE A TOUR TO CAMBODIA? There are many tour operators and travel agencies that offer tours in Cambodia with different itineraries, but all include at least a couple of days between the temples of Angkor. Departures can be as a group with fixed dates group or just individual (even for only yourself) by communicating to the travel agency the route you want to follow . The tour in Cambodia presented in this trip review was booked through Asiatica Travel as individual departure, in conjunction with a trip in southern Vietnam (it is quite usual to combine a trip to Cambodia with tour in Vietnam and maybe Laos, thus covering much of Indochina, but it all depends on how much time and budget you have available). HOW TO GET TO CAMBODIA AND TO THE ANGKOR TEMPLES? Getting to Cambodia is usually simple: some airlines such as Qatar Airways offer connecting flights via Doha, otherwise there are a good number of connecting flights via Bankok. To get to Cambodia from Vietnam there are many flights, most non-stop, very convenient if you decide to visit both countries. Generally, the city in Cambodia where you will land will be Phnom Penh, from where you can get to Siem Reap (the city of temples of Angkor) by a road transfer of about 6 hours, or through a short connecting flight. However, there are increasing international flights arriving directly into Siem Reap. This tour in Cambodia took place during the first week of April, traditionally the hottest time of year, with daytime temperatures that can exceed 37 degrees. However, this is also the peak of the dry season, so it rains less than the following months, which are fresher. Climatically speaking, the best time to visit Cambodia would be in December (cooler temperatures and very little rain), but this, together whit August (which is rainy) is also the period of greatest influx of tourists and therefore I would not recommend these months to make a trip to Angkor. The temples of Angkor are “assaulted” by about 2 million visitors every year and this is a problem, especially when every tourist wants to click a souvenir photo in front of every statue or archaeological find in the most absurd positions. Angkor Thom is a real city, capital of the Khmer empire and civilization; it’s dominated by the majestic temple of Bayon and characterized by high stone towers with the face of Buddha carved on the facades at the four cardinal points. The temple of Angkor Wat is probably the most famous of the temples of Angkor. It consists of a huge complex of buildings, whose walls are finely decorated with low-reliefs in excellent condition, showing figures of Khmer women (devata) and other drawings. The Ta Prom temple is known by Cambodians as the Tomb Raider temple or temple of Angeline Jolie, as it was the film set of the famous movie and video game. Buried by the jungle until a few years ago, the temple is characterized by the stems and roots that grow above the ruins. At a short distance from Siem Reap and the other temples of Angkor, there are some minor structures, but equally spectacular, dating prior to Angkor Thom. These temples are built in pink or red sandstone, which gives them their characteristic color. Cambodia is not only Angkor, but it is also a country that has much more to offer, and even a car trip from Siem Reap to Phnom Penh allows you to appreciate some aspects which you will miss running only along the usual routes suggested to mass tourism. The trip to Cambodia comes to an end with a visit to Phnom Penh and its magnificent Royal Palace with the Silver Pagoda. I have also a trip to the National Museum of Cambodia and the Wat Phnom pagoda attended by many believers. In the travel industry, there are several things and new services that are developing and expanding quite quickly. In this short arcticle, we would like to speak about Meet and Greet at the airport, with direct transfer to your hotel. Such service is offered, for example, by Taxi Airport Pickup company. After a long flight you may be quite tired, therefore, having a driver waiting for you at the airport, like one from this airport transfer operator, will be a pleasant and relaxing way to get to your hotel, rather than hiring a taxi locally or having to search for public transport. And what if your flight will be delayed? No worries because Click Airport Transfers will check the status of your flight and will reschedule the trip accordingly, without any supplement. Also the reverse trip, from hotel to airport, may be an aspect to be taken into account: what if all the taxis are busy and no one can give you a ride to the airport? By booking in advance a car and a driver, there is no such risk, because you may book up to one year in advance and once all is confirmed, you can enjoy your trip in full peace of mind. Sometimes some people ask me why pay so long in advance for such service, but many operators of car transfers actually accepts cash money to driver on the day of the trip, which is another very good reason to book in advance. And what if you are a travel agency and need to pay for your customers? No problems! Other operators, for example from airport shuttle web site offer the option of paying the ride in advance on behalf of someone else.